Jack has been healthy for 397 days! What a difference a year makes! Jack continues to do so well and he is living life like a normal kid. His story truly is a miracle and we continue to be so grateful that he is alive and healthy. His favourite things right now are to swim at the Y, read, and play with his little brother, Christopher. He’s very excited about this year’s lemonade stand! This year’s event is set for: Saturday, May 28 9am – 2pm at Pine Glen Park in Oakville, ON. My heart is bursting with love and pride! 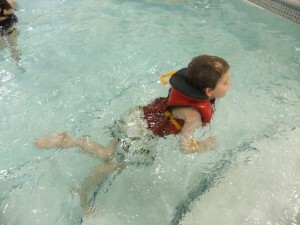 Another milestone – Jack can swim! 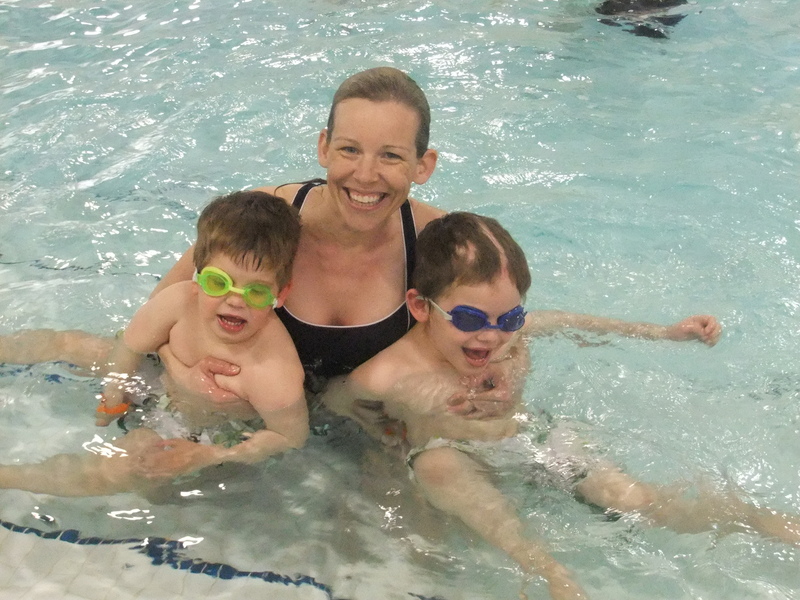 This weekend was another milestone for Jack – he came home from Bloorview for the weekend and went for his first post-op swim! I can’t express in words how joyful it was to see Jack laugh and play with Christopher. They loved pretending to be sharks and pirates and they were both exhausted afterwards. I feel like Jack is officially back! His sweet, funny disposition has returned and I am cherishing every single moment right now. 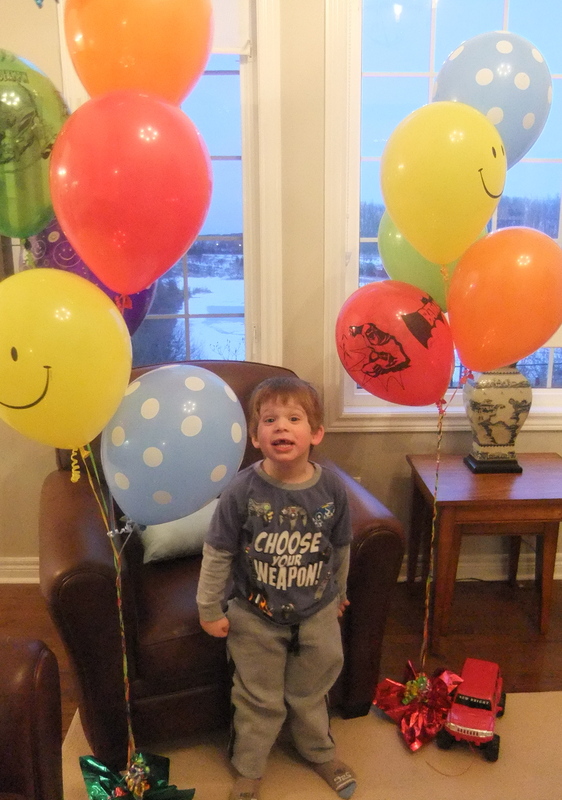 And we’ve received great news – Jack will be moving back home for good this Friday! We are so excited and we still haven’t seen any seizures since his last surgery on January 25th. 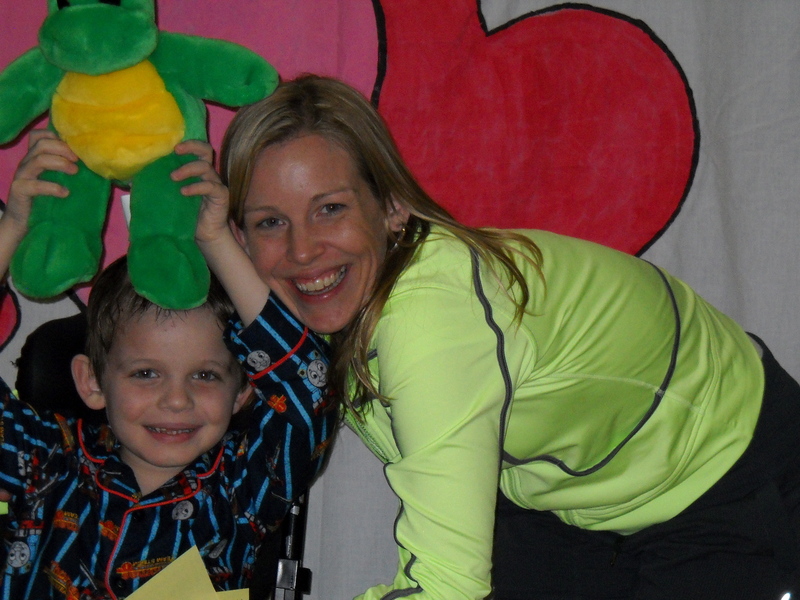 We are back at SickKids again this week for a follow-up with his neurosurgeon, Dr. Rutka. We know that the seizures can return at any moment, but the doctors remain very encouraged that Jack is doing so well post-op. We continue to celebrate every healthy day! Jack continues to do amazingly well and surprise us every day with his progress. He was home again for the weekend and thoroughly enjoyed his time with Christopher. They even went to the park yesterday and enjoyed the sun! We found out last week that Jack only has 3 more weeks to go at Bloorview and then he will be home for good – yeah!!! He still needs a lot of therapy and once he returns home he will receive therapy through Erin Oaks and we will make a transition plan for him to gradually go back to school. And the best part is still no seizures!!!!! We’re back at SickKids this week and next for post-surgery follow-ups and I can’t wait for his doctors to see him run down the hallway! It actually brings tears to my eyes as I type this just thinking of the progress Jack has made since we last left SickKids with him in a wheelchair and otherwise bed-ridden. Have a great day and enjoy the sun! Watch Jack in action! We are SO proud of him! He has made great progress again this week and his coming home for the weekend. He is moving more and more and making great strides. He still has a really long way to go with his speech and he is still tiring very easily, but every day he is stronger! Jack relaxing at home for the weekend! Jack is back home for the weekend and he is having so much fun with Christopher. They have been having movie nights and we even went out to Chapters and Licks yesterday. It is amazing to watch how people treat you when you are pushing a child in a wheelchair. I’ve described it as being like the parting of the red sea! Every time someone stares, I feel like saying “He’s OK. He’s so much better now after his operations and he’s going to walk again!” And at first I was a little sensitive about everyone staring, but I now realize that they are looks of compassion. Jack has really made remarkable progress this week. He is walking more, relying on his wheelchair less, taking less naps throughout the day, and starting to speak more. He is even playing on the computer this weekend, so his fine motor skills are really coming back. Overall, he is still weak and experiencing a lot of weakness on his right hand side, but he is getting stronger every day. And the best part is that we have not seen a seizure in 26 days! It is so incredible and makes all of this worth it. 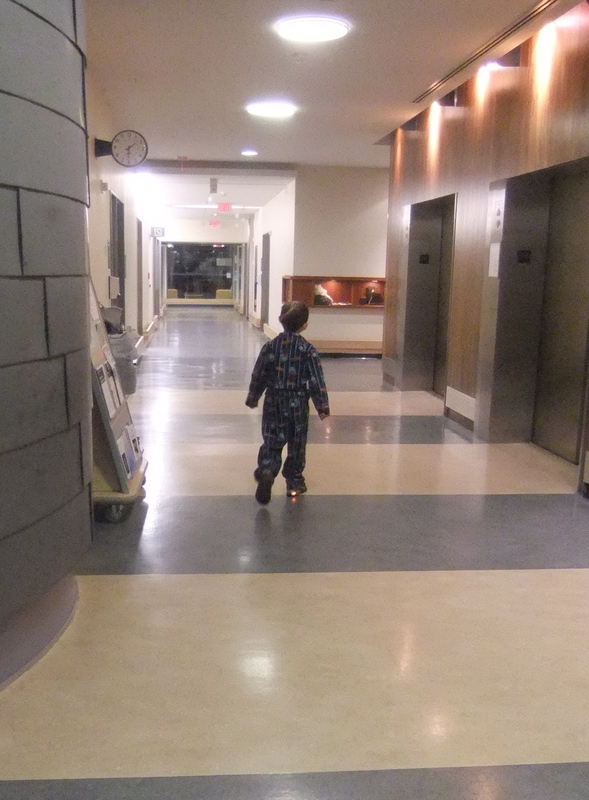 Jack and I are headed back to Bloorview tonight and will next return home again on Friday. Look how far he’s come! 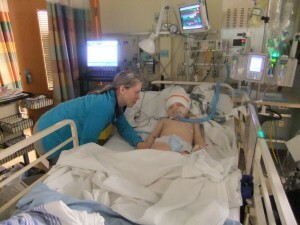 Looking at this picture with Jack in the ICU, where he had part of his skull off of his head for six days between surgeries and was unable to breath on his own following the second surgery, I am in awe of his recovery! He is so unbelievable resilient and he continues to make progress every day. 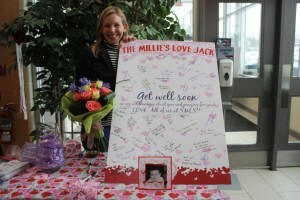 The picture of Jack with the stuffed animal was at a Valentine’s Party at Bloorview. They had cards, a photo booth, and other special activities for the children. Jack had so much fun and really felt special there. I can see more and more of my little sweet Jack returning every day. He had a relaxing weekend at home and at one point when Christopher tried to wrestle with him, Jack hopped off the couch and chased him down the hallway! He quickly sat down right afterwards, but it was the first spontaneous burst of energy and running that we’ve seen! It nearly gave me at heart attack to watch, as my xray vision seemed to look right through Jack’s head to the titanium screws keeping his skull in place, but it was amazing to see his legs moving like that!!! Jack is now back at Bloorview for the week and Grandma is with him again today. I can’t wait to see him tomorrow and see his progress! Jack responding well to therapy! Bloorview Rehab’s Brain Injury Program is really incredible and Jack is responding well. 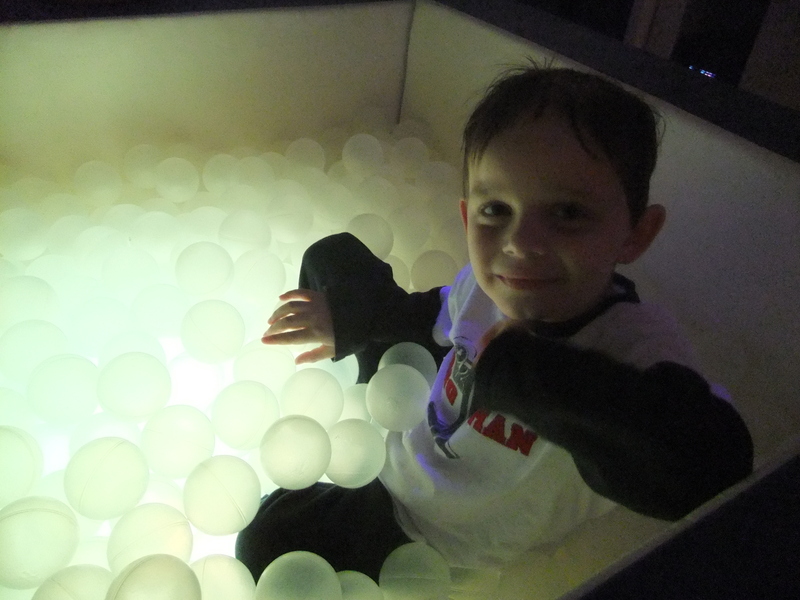 Today’s picture shows Jack sitting in a bunch of lit up balls in a special therapy room with low lighting, specifically designed to relax and sooth children. The staff are wonderful here and he has made a lot of progress this week. He can now take 7-8 steps on his own, is using more words, and sleeping less. His sweet little personality is also coming back, which is great to see. We have been told that it could take up to 3 or 4 months for his personality to fully come back, in large part due to the trauma of surgery. He is still dependent on his wheelchair, but he has now figured out how to make it go and he’s really enjoying wheeling away from me! Jack has physio, occupational and speech therapy this morning and will then be heading home for a long weekend at 2pm! I am SO proud of him for how hard he is working in therapy. He often works to the point of exhaustion and often falls asleep after his sessions. Yesterday, a 15-yr-old Oakville girl named Isabella (the girl in the group photo with a pink flower in her hair) rallied the students at St. Mildred’s Lightbourn School and held a hot chocolate and cookie sale to help Jack and his Jack’s Lemonade Fund at SickKids! 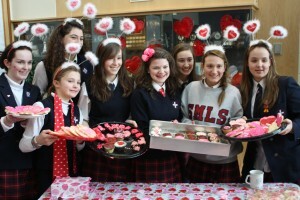 The students, staff and parents were incredibly enthusiastic and supportive. What makes Isabella so special and courageous is that she, too, battles seizures. As I listened to Isabella talk to her classmates about Jack and her own journey with seizures, I was moved to tears by her poise, grace, and confidence. She then presented me with a gorgeous bouquet of flowers and cards made by the students. 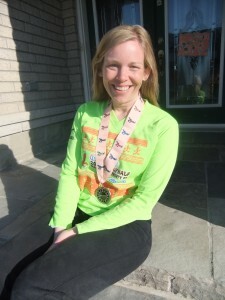 She is an incredible young lady who is proving that seizures don’t need to be a barrier to achievement! Thank You Isabella and Thank You St. Mildred’s Lightbourn School! Watch for the article in the Oakville Beaver! Christopher is being the best little brother! 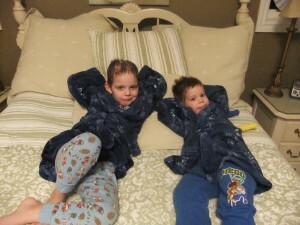 Thank you to those of you who have taken a moment to think of and pray for Christopher, Jack’s 3-yr-old brother! And the balloons from Helen, Dave, Ally, and Ryan across the street were a particular hit with him! In all the craziness of commuting, not being home and giving Jack so much attention, Christopher has really had to be strong throughout all of this! He is such a special little guy and the best little brother. Since Jack has been gone, Christopher sleeps in Jack’s bed every night by himself and asks every night when Jack is coming back. He just doesn’t get why Jack has to be away for so long and he misses his big brother a lot. It was also hard for him last weekend when Jack came home and still got most of the attention because he requires constant care. The one thing Christopher did find cool though was Jack’s wheelchair! He kept asking when it was his turn for a ride and at one point tried to eject Jack from the chair! Thank goodness for seatbelts! 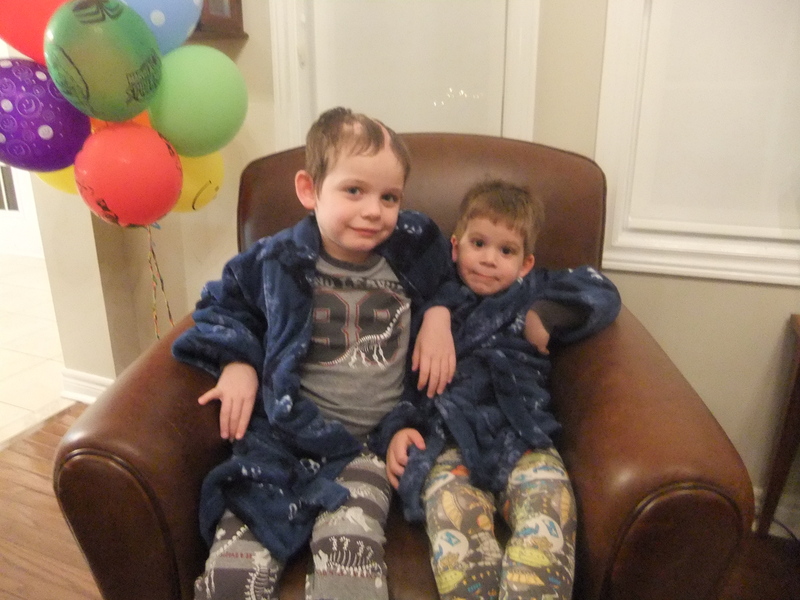 My biggest fear was that Christopher would try to give Jack a ride around the house in the chair and sending him flying down the basement stairs, so you can start to see why constant supervision is required on the weekends around here. As for Jack, Grandma is still taking amazing care of him at Bloorview. I can’t believe how lucky I am to have such an incredible mom. She has been a rock for Jack (and me!) and the most incredible support. Thanks MOM! I will have to nominate her for a MOTHER OF THE YEAR award! If anyone knows of any contests, please let me know!